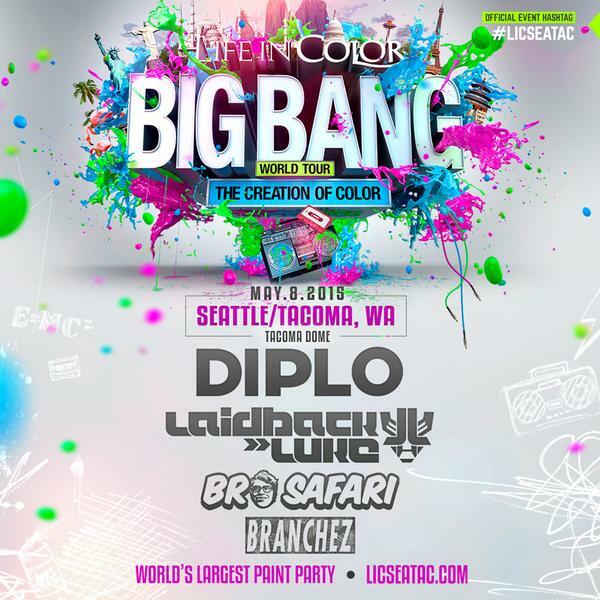 EmeraldCityEDM | Life In Color 2015: Seattle/Tacoma with Diplo, Laidback Luke, Bro Safari, and Branchez! 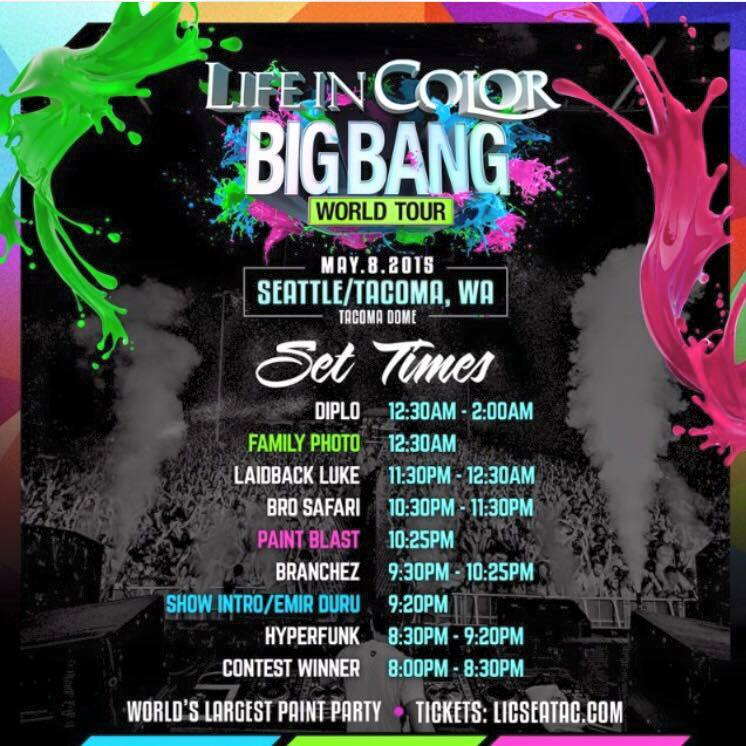 Life In Color, aka Dayglow or The World’s Largest Paint Party, returns to Seattle/Tacoma on Friday, May 8th 2015! Announced via Facebook and Twitter, USC Events & Life In Color present the “World’s Largest Paint Party” at the Tacoma Dome on Friday, May 8th with Diplo, Laidback Luke, Bro Safari, and Branchez! Don’t forget to stay up to date on local EDM events happening in Seattle by following the EmeraldCityEDM Upcoming Event Calendar. DJ Competition “Life in Color Global Talent Search”: Do you have what it takes to play one of the world’s biggest stages? Life in Color & Wavo have teamed up to give aspiring artists around the world the chance to play a massive Life in Color show in their hometown. Get creative! We want to hear the best mix you’ve got. Record between a 30-60 minute mix, original content is encouraged! Submit it here. -Stay tuned to this post for more opportunities to win LIC tickets. Find more opportunities to win tickets to local EDM shows at the Contests & Giveaways page! Afterparty: Join Trapped Productions at Encore Nightclub in downtown Tacoma for a Life in Color unofficial AFTER PARTY! Keep the party going ALL NIGHT at our high end nightclub located in the heart of downtown with DJs DARRIUS, JOHNNY MONSOON & SHARPS! Looking for Life In Color 2016?